A dissertation is a very serious and troublesome academic assignment. The requirements are strict and demanding. It’s necessary to make an in-depth research and study every element and details related to the studied problem. This is not an assignment that can be completed in a day or two. Students write it for months and, still, may fail miserably. In addition, the academic subject can potentially induce some difficulties. Thus, a biology dissertation is pretty complicated. This is a complex learning about animals, plants, microorganisms as well as about the human race. Therefore, it’s not a surprise that this subject is difficult. Not all students are able to handle this task properly. Some may not know the material good enough, the others have poorly developed writing skills, lack time and something of the kind. If you wish to succeed in this important assignment, you ought to continuously improve your writing qualities and enrich the knowledge about every subdivision. Anatomy of the defects heart. This is a very broad direction, which offers a great variety of options. It is associated with the human, animal, and plant functioning of the heart. Thus, your topic may be related to such diseases as cardiomyopathy. It impairs the normal way our heart is squeezed when it pumps heart. Quantitative and qualitative scientific methodologies. Biology is an important discipline and it requires the implementation of certain methodologies. Use the quantitative and qualitative observations. Quantitative returns numerical data. The qualitative method depends on the specification of the research and is more subjective. It doesn’t record data. Stem cell therapy against diabetes. Stem cell therapy is one of the most promising medical treatments, and it treats lots of severe ailments. One of them is diabetes. Multiple types of research and clinical tests have already approved its potential. You’re free to highlight it. DNA damage and its consequences. Many answers about the human development, behavior, immunity, etc. can be found in our DNA. Once it’s damaged, it negatively reflects on our body. 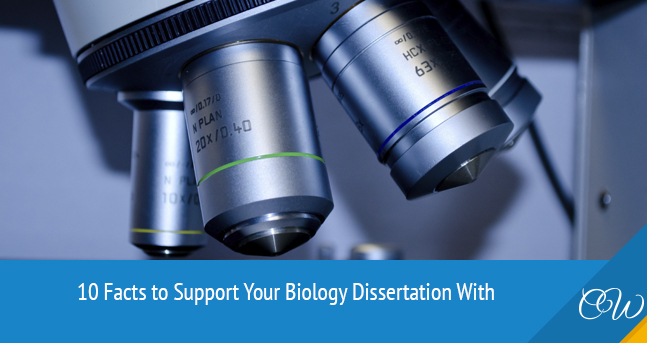 Your dissertation may concentrate on such consequences as oxidative stress, hydrolytic damage, etc. Evolution of Australopithecus. The process of evolution is crucial and gives lots of answers about who we are and how we’ve become those who we are. Learn about the evolution of Australopithecus and use this information in your dissertation. The link between genes and diseases. It’s possible to define the causes of the development of multiple diseases if you learn the influence of genes. Answer how does genetics impact health and disease in your research? Crucial facts about animal extinction. Fauna is important. Unfortunately, many species are already lost forever. There are others under the threat of extinction. Highlight the main factors, which may help to understand why so many animals are gone. The medical resourcefulness of plant. We should never forget about plants. They are the inevitable part of our world and play an important role. Thus, you are welcome to write about their medical usefulness. They are able to cure or/and prevent lots of ailments and health deviations. Ecology issues in Africa. Many things and living conditions of every living creature depend on our environment. We can spot definite tendencies if we study typical problems. Write about problems in Africa, such as deforestation, air, water, oil pollution, loss of biodiversity, etc. Protection of the wildlife in India. It goes beyond all doubts that the matter of wildlife protection is utterly important. It’s difficult to cover this broad theme. Therefore, concentrate on a narrower theme. Thus, you’re free to highlight the current issues of wildlife protection in India. Disclose the possible consequences of ineffective protective measures. Keep these points in your memory. One never knows when this or that theme may come to his/her aid. All these themes are of great importance in biology and can be potentially added to almost every dissertation topic. Take all that is possible and show a link to your main question. It’s quite possible that these facts may play the decisive role to provide your research with the needed grades. Of course, you should use them only when it’s possible. Study your topic from different angles and try to combine it with some of these 10 points. This may be really beneficial.